When we have huge result set it doesn’t make sense to return the complete result set to the application and leave it to the datagrid, gridview or any other data control to handle the data paging. Because it wastes lot of network resources, puts pressure on the database server and the application server, so it makes page loading very slow. In such scenario it makes sense to return only the rows which needs to displayed on the current page, when user clicks next page/next result set then bring the next set of rows. In this way it reduces the unnecessary network traffic and load on the data base server, which in-turn helps in faster loading of the page. With Sql Server 2012 Microsoft has introduced OFFSET and FETCH feature for data paging. Prior to Sql Server 2012 CTE was on of the option for data paging. 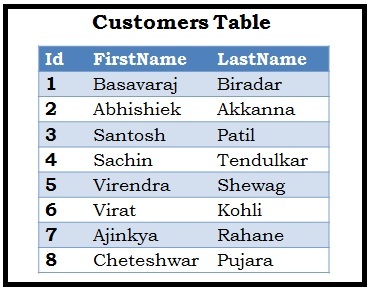 -- Create an Customers table. We can write a stored procedure like below for Data Paging by using the OFFSET..FETCH pagination feature introduced in Sql Server 2012. This stored procedure gives specified number of rows (i.e. it can be specified by the parameter @pageSize) for the passed page number (i.e. parameter @pageNum) sorted by the FirstName column. Try to get the first page data sorted by FirstName by executing the above Stored Procedure, assume that the page size as 3 for our example. Now try to get the second page data sorted by FirstName by executing the below statement. Now try to get the third page data sorted by FirstName by executing the below statement. The reason we got only two records in the above result even when the data page size 3 is, the demo Customers table created in this article has only 8 records. So, with page size as 3 the third page will have only two records. We can write a stored procedure like below for Data Paging by CTE. This stored procedure gives specified number of rows (i.e. it can be specified by the parameter @pageSize) for the passed page number (i.e. parameter @pageNum) sorted by the FirstName column.